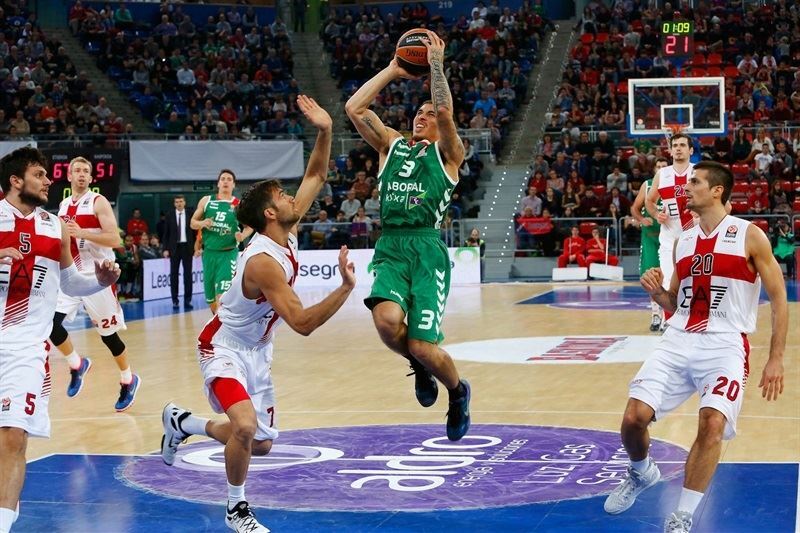 Laboral Kutxa Vitoria Gasteiz got back to its winning ways, hitting 13 three-pointers and taking a significant step towards a place in the Top 16 with a comfortable 94-82 win over the visiting EA7 Emporio Armani Milan on Thursday night. 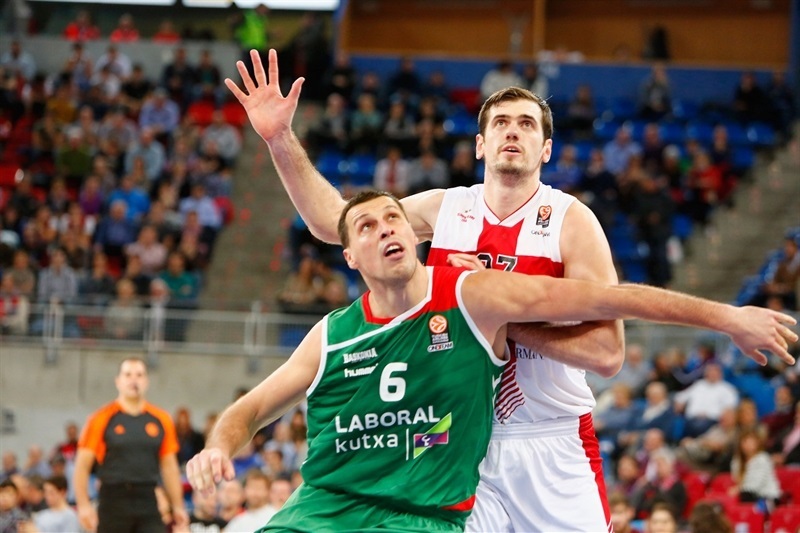 Win improved Laboral to 4-2 and gave it sole possession of second place in Group B, while Milan dropped to 1-5 with its fifth consecutive loss. The hosts started pulling away late in the first quarter behind Fabien Causeur, and the margin reached double figures early in the second with triples from Mike James. 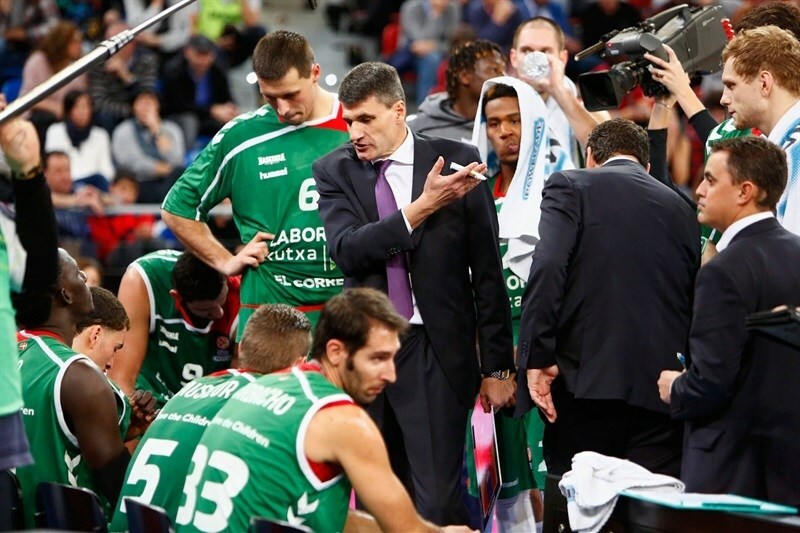 Laboral led 52-37 at halftime, and the difference quickly reached 20 points in the third quarter. The visitors never gave up, and got within 77-72 with six minutes to go, but never closer than that. Causeur finished with 22 points on 4-for-5 shooting from three-point land. Darius Adams added 20 points, Ioannis Bourousis amassed 14 points plus 13 rebounds, while Kim Tilie contributed 10 points for Laboral. For the visitors, Alessandro Gentile scored 24 points, Stanko Barac had a big double-double of 16 points and 12 rebounds, while Jamel McLean scored 13. Laboral Kutxa needed no more than 20 seconds to nail the first three of the night through Causeur, who gave the hosts an early 3-0 lead. Gentile answered from the free throw line, followed by a put-back by Andrea Cinciarini that ended a long streak of missed shots by both teams. Adams and Adam Hanga came to the rescue and hit back-to-back threes that brought the lead back to the hosts, 9-4, after four minutes. Gentile and McLean reacted and reduced the gap to just 1 point right after that, but another bomb by Adams, followed by a couple of free throws by Causer off a unsportsmanlike foul set up a 6-point margin, 14-8, for Laboral midway through the first quarter. Gentile found Barac for an easy layup, while Robbie Hummel brought the visitors within 14-12 after the TV timeout. Kim Tillie completed a basket-plus-foul play, but Charles Jenkins replied immediately with a shot-clock-beating three to keep Milano close with three minutes to go. Causeur kept punishing from outside with another three, the fifth of his team so far, and even though Cinciarini took another bucket off the fastbreak, the French guard raised fans on their feet with a three-point play and another three to set a 9-point margin, 26-17, entering the last minute. Barac dunked the ball off the offensive rebound to break the trend, as Kristjan Kangur closed the quarter with a pair of free throws to make it 28-19. Gentile hit a contested jumper, followed by another basket by Barac off the offensive rebound. The hosts committed consecutive turnovers, before Mike James came to the rescue with back-to-back threes that forced an urgent time-out by Milan Coach Jasmin Repesa, as the difference reached double digits, 34-24. 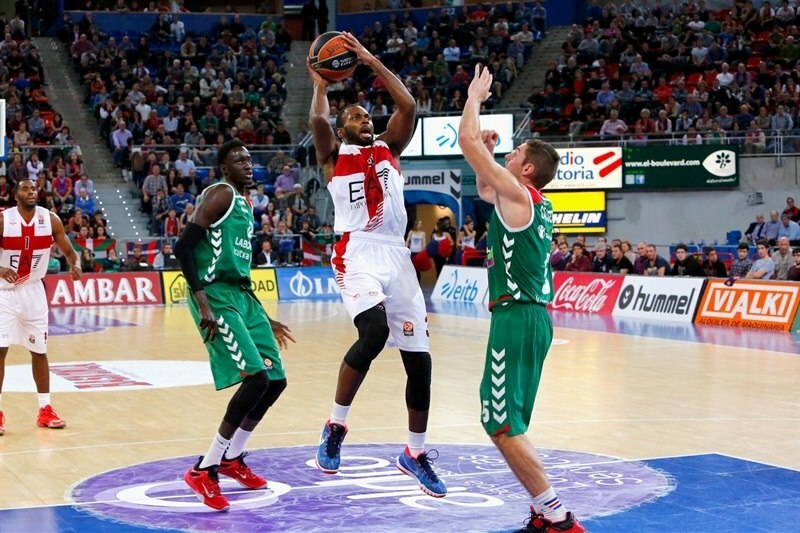 Oliver Lafayette scored a difficult layup and added the extra free throw, but Laboral had found already its momentum. Hanga scored a layup off the baseline while James connected again from downtown to make it bigger, 39-27, with six minutes to go. McLean and Bourousis exchanged free throws right before Tillie contributed with another three-point play to set a 15-point edge that turned on the red light on visitors’ bench. 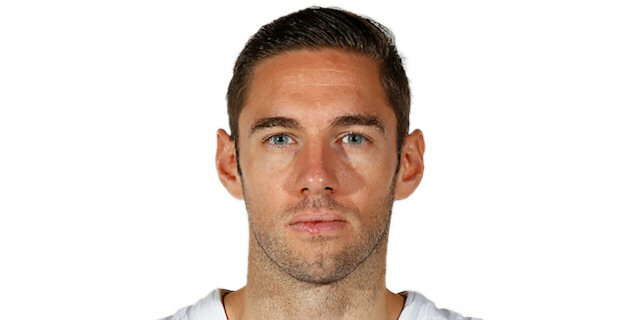 Barac looked like the only one able to put Laboral’s defense in trouble, and scored again, but Milan needed more contributions from other players. A couple of missed free throws by Hanga allowed the visitors to breath, as McLean and Cinciarini showed up to reduce the difference to 46-34 with three minutes to go. The scenario had already changed, with more half-court game and several free-throws, slowing the pace down. The bad shooting percentage from the line, plus the bad night so far of his perimeter shooters prevented EA7 from a sound comeback, as Laboral Kutxa was struggling offensively. The drought came to its end for the hosts thanks to Causeur, who remained perfect from the three-point line and hit his fifth entering the last minute. Barac added another put-back, but James replied with an acrobatic layup on the buzzer to finish the first half with a solid 52-37 lead. The three-point festival continued after the break, as Adams connected again from the corner. Milan needed something to happen urgently, but nothing seemed to work. A couple of turnovers and a missed jumper by Jenkins allowed the hosts to reach a 20-point margin on a circus layup by Adams. McLean broke the lock on Laboral’s rim with a layup, but the hosts found no trouble to keep Milan at a safe distance as Gentile remained seated on the bench for the first five minutes of the quarter. The difference remained stable midway through the third quarter, with Tillie as the main contributor for the hosts at that moment. Gentile took the court and showed his skills with a strong drive, followed by McLean to make it 63-47 with three minutes to go. There was no room for a longer streak, as Bourousis thanked Adams’s unselfishness with a powerful dunk right after that. Adams added 2 more points from the line to return a 20-point lead to Laboral, 67-47, which seemed to send the game to a premature ending. 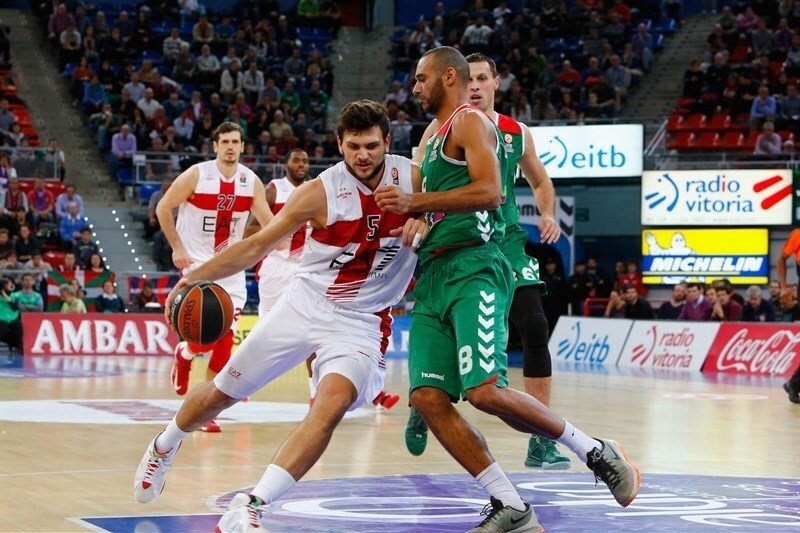 Milan didn’t give up, though, and back-to-back buckets by Hummel and Barac dropped some water to Laboral’s fire. It was James, with 5 points in a row from the line, who broke the trend, as Bruno Cerella hit from downtown to close the quarter with the guests trailing 72-54. Gentile opened with a jumper, followed by a strong layup by Cinciarini to bring Milan within 72-58. Blazic hit once from the line, but Hummel and Gentile connected once each from downtown to turn the game upside down in less than two minutes. 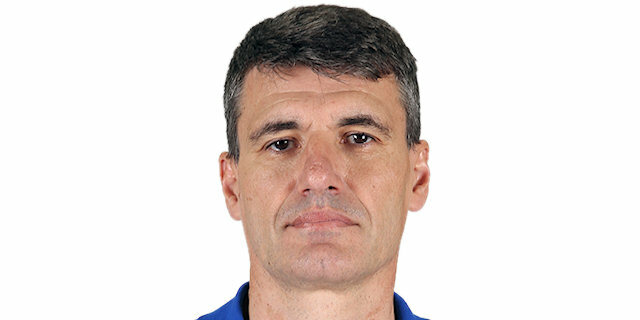 Coach Perasovic reacted immediately and called for an urgent timeout with Laboral still leading, 73-64. Repesa switched to zone defense after the break and Gentile hit a short jumper to make it even closer, but a technical foul called on the Milan coach and a coast-to-coast layup-plus-foul play by Bourousis allowed the home team to go into a double-digit lead, 77-66, with six minutes to go. Gentile remained hot and nailed back-to-back threes to make it 77-72, but the hosts didn’t panic and found some room through Causeur, Adams and Bourousis, who capped an 8-0 run with a three to avoid anxiety. 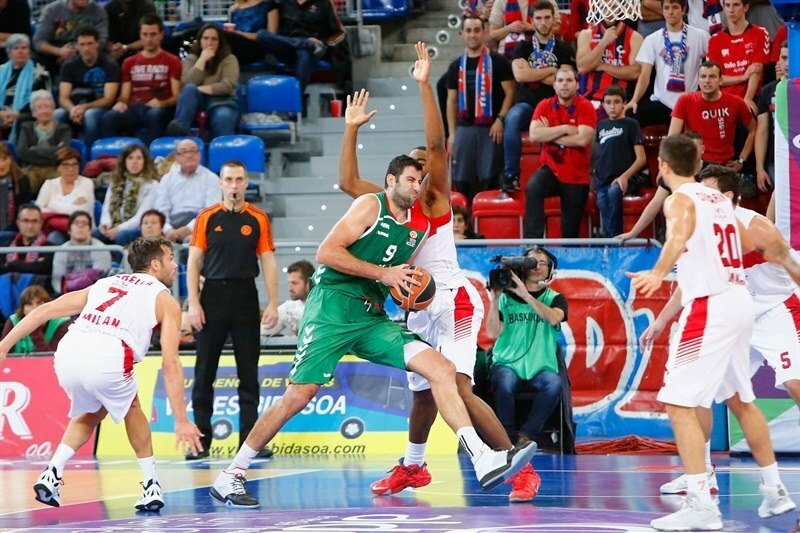 Gentile showed up again with a basket, followed by a pair of free throws by McLean to bring Milan within 85-76 with four minutes to go, but Bourousis had already started his own show. The Greek center added 4 points in a row right before Hanga and Cinciarini fouled out, as Causeur added another two from the line for a 90-78 home lead. 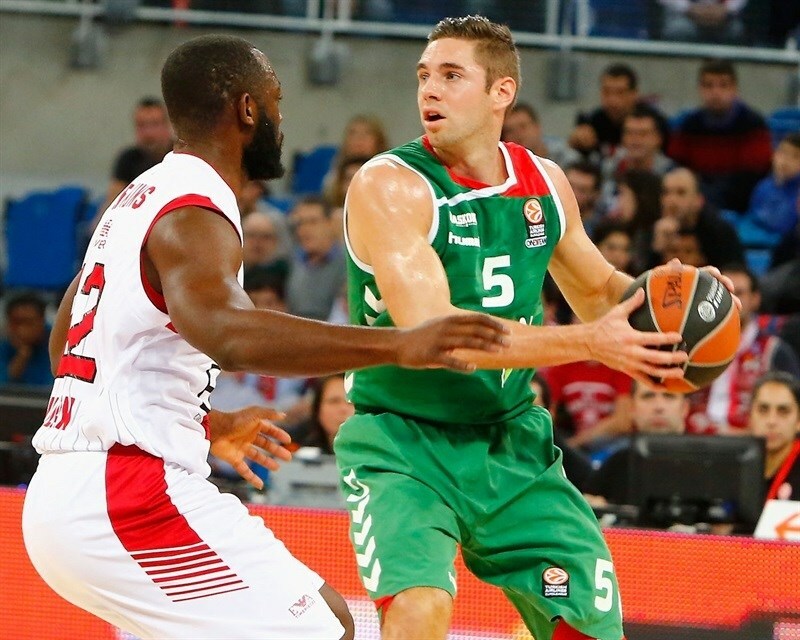 Hummel reduced the margin to 10-points with a nice jumper, but consecutive blocks on Gentile by Causeur and Bourousis destroyed all Milan hopes. Adams hit twice from the line to make it 92-80 entering the last minute with the outcome in no doubt, as Barac contributed inside and Adams capped a nice alley-oop with a two-handed dunk to seal Laboral’s fourth win. "It was a very important game for both teams. When you face a game like this, you can have some doubts or worries about the performance the players will have, if they are going to be able to have the right answers for the challenge. But tonight we played a very good game, except some minutes in the last quarter that reduced our margin to just 5 points. When we were up with a big lead, I told my players that we needed to do something more, because it’s very difficult to be so accurate all game long. I think we deserved this win and that were are closer to our target, which is to make it to the Top16, but until that is sealed mathematically, we cannot relax and we must keep fighting. " 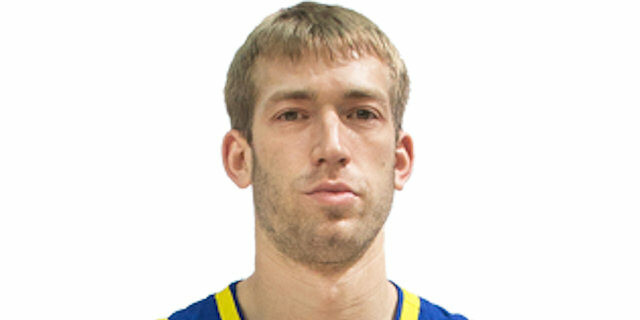 "Congratulations to Laboral Kutxa. They absolutely deserved this win. Everybody knows we are in an extremely difficult period. We tried, but we couldn’t play as we wanted today. 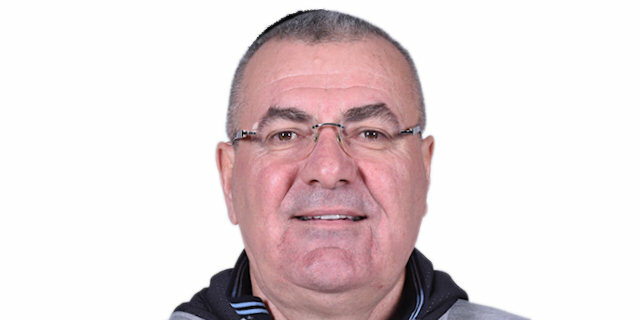 I would say our situation is similar to Real Madrid, that had many players playing in the EuroBasket and later they went to Latin America. We had some players coming from the European Championship and had to play in the States, so we had to start Euroleague with just three days of preseason. I don’t want to take it as an excuse, but it is definitely a problem, that’s easy to see for everyone. 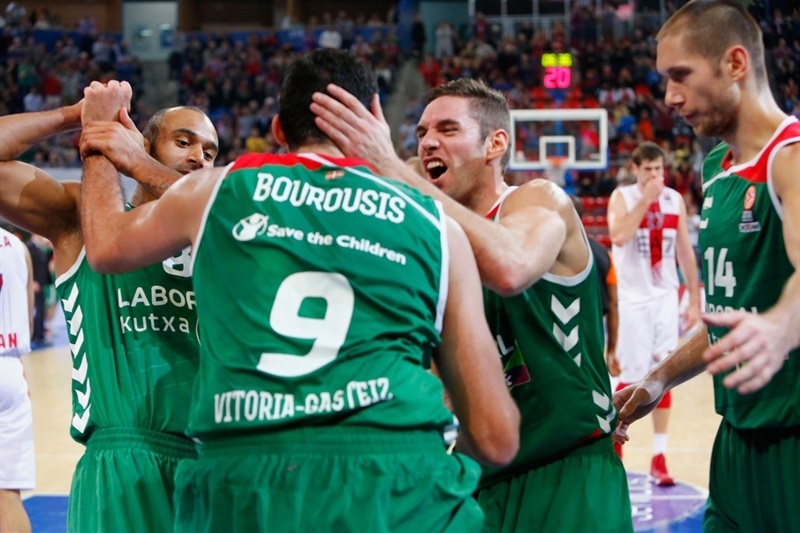 Laboral Kutxa plays tough traditionally, and they were able to score 94 points. They opened the game scoring too easily, with a lot of three-pointers, so they got confident and it’s not easy to fight against them when they reach that confidence level. I want to stay positive, because I saw my team never gave up. We need to work now, but we are also far from the shape we want to be at on the court. " "I think we did a great job for 35 minutes tonight. We relaxed a little bit in some moments of the last quarter and that made us fear a potential comeback by them, but the team had a great reaction in the end. We had a great shooting night, making a lot of threes, but we need to increase the defensive level a little bit. We managed to connect two or three good defensive plays in the end, secure our rebounds, run the court and feed Bourousis inside, who gave us life." "They shot the ball very well, especially at the start of the game, and that made us find ourselves in a hole. In the second half we tried to fight and get back, but when you are down by 15 or 20 points you have to put so much energy to come back that you don’t find it in the end. We were close, we were able to come within 5 points, and we avoided a blowout, but it’s not good to lose. It’s frustrating, but we have a game on Sunday and we have to keep working. It’s true that a good thing we can take from tonight is that we never gave up. Giving up is not good and we cannot let ourselves fall into that even though if we don’t qualify, we still have a lot of games ahead and we must keep working. We know it’s gonna be tough, but we’ll see what happens."